Everything Rachael Ray: Have you tried a Knork? Have you tried a Knork? 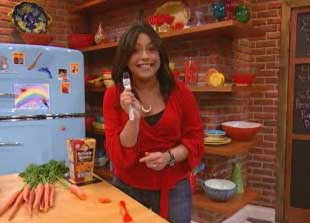 Awhile ago, Rachael Ray featured knork on her talk show. You can check out some video of the segment here. The idea is to have a fork that can cut like a knife (or a knife that can be used like a fork, I guess....). Rachael showed how you can cut even a carrot with knork. Like Rachael, I'm usually not that into kitchen gadgets because I really hate clutter, so I was skeptical! The folks at Knork were kind enough to hook me up with a few to try out and I have to say they were fun! Now, admittedly, it could be the novelty factor, but I swear the darn things did cut much better than a regular fork. I tried them out on a chicken breast, green beans, and potatoes, and it handled all of them perfectly, even the thin, hard to cut skin on the potatoes. These little guys are perfect for camping (they come in a plastic version) and I know I'll be using the stainless steel ones one a regular basis. So, I guess I have to agree with Rachael once again - these are a fun kitchen gadget. I was thinking, with everything lately being all about going green, do you think using a knork would count? One less piece of cutlery to wash means less water used and less detergent, right? Is that too much of a stretch?